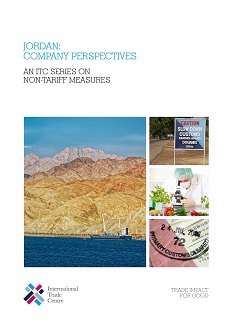 Following a formal request from Jordan’s Ministry of Industry and Trade and Supplies, ITC launched a survey on non-tariff measures (NTMs) in Jordan at the end of April 2015. The survey is being implemented by a local surveying company, Ipsos Jordan. The survey aims at unveiling trade barriers faced by the Jordanian private sector in their business operations in order to reduce bottlenecks to trade. The results will increase the understanding of the current trade and business environment in the country and will allow private and public sectors to identify potential actions to improve the development and competitiveness of Jordanian firms. Initially, companies are contacted by phone. ITC encourages participation in interviews and reporting of all burdensome NTMs and other obstacles to trade that they may face in their country or abroad. Responses to this survey are strictly confidential and individual information is not disclosed. After the collection of data, ITC will run a thorough analysis and only provide the Ministry of Industry and Trade and Supplies with a report summarizing the results. The data collection phase is currently ongoing in collaboration with Ipsos Jordan. Interviews with half of the 650 firms targeted by the survey have already been conducted. On 27 April 2015, ITC held the first stakeholder meeting on NTMs in Amman, Jordan, to officially launch the survey in the country. Government officials from various ministries as well as representatives of trade support institutions and other stakeholders from the private and public sectors attended this event. During this launch, ITC presented its programme on NTMs and introduced the objectives and the methodology of this survey as well as results obtained in other countries. Presentation: ITC survey on Non-Tariff Measures in The Hashemite Kingdom of Jordan.